Fresh berries packed and ready to ship. Postharvest Cooling and Handling of Blueberries Blueberries are a popular early summer small fruit. Successful blueberry marketing requires that the fruit not only be of very high quality but that it also be properly packaged and thoroughly cooled. This publication explains the postharvest handling procedures necessary to deliver North Carolina blueberries of the highest quality. Forced-Air Cooling – General Principles Forced-air cooling is used increasingly in North Carolina to cool produce quickly. This publication explains the benefits of this method as well as the technical aspects required for maximum energy efficiency. Design of Room Cooling Facilities: Structural and Energy Requirements A step-by-step guide to planning, designing, building and maximizing the efficiency of room-cooling facilities. 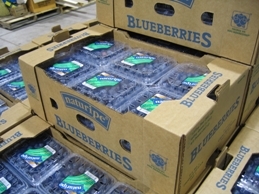 Blueberry Grade Standards U.S. Grade Standards provide the produce industry with a uniform language for describing the quality and condition of commodities in the marketplace.